Schemata Workshop Open House and PARKing Day at Schemata Workshop in Seattle, Washington, on Friday, September 16, 2016. While cohousing has traditionally been established in rural or suburban contexts, as a cohousing consultant I am seeing an uptick in those who are interested in building urban communities. There are benefits to urban cohousing, many of which are mirrored in the reasons my husband and I chose an urban location in Seattle to start our own cohousing community. While our reasons for choosing this urban lifestyle are personal, I believe they resonate with many other families, seniors, and individuals, such as those who found and joined us on our cohousing journey. Here, I will make a case for urban cohousing, and discuss how our community has benefited from our densely urban location. Please note that I use “community” to describe our cohousing community and “neighborhood” to describe the greater neighborhood that surrounds it. Why choose an urban site? There are some simple yet practical reasons to choose urban cohousing. Urban sites usually have the zoning in place to build multifamily housing, whether it be stacked flats or clustered homes. This translates to reduced time and expense for land use approval, there are no rezone applications or hearings, and there is a reduced likelihood of neighborhood opposition. Fewer hurdles to development can mean fewer expenses and a faster development process. Urban sites also have the added benefit of convenient access to coffee shops, grocery stores, and restaurants. But because of our society’s reliance on cars, one’s ability to drive and maintain a driver’s license can stand in the way of the convenience that walkable neighborhoods afford. For many, including the young and elderly, walkability should also be considered interchangeable with independence. Walkable neighborhoods allow everyone of all mobility and ability levels to enjoy the freedom of meeting with friends, running errands, and going about one’s day without relying on another person to shuttle them to and from the activities of daily life. The same is true for individuals who choose to live without a car, families with one vehicle, and others who might otherwise be homebound without access to a vehicle. Walkability, in conjunction with the abundance of services made available by an urban site, makes urban cohousing an attractive option for many cohousers. “Urban” means different things to different people. For those who are used to living in rural areas, urban is anything within the city limits. For others urban is a single-family house in a residential neighborhood within walking distance of coffee shops and a grocery store. For still others, urban means living in a multistory building within a dense urban neighborhood with shops and services at the street below. When starting a new urban community without a site determined, it’s important to define what you mean by “urban” so that newcomers are clear about how urban you intend to be. Who does urban cohousing attract? Urban sites attract a diverse set of people for many different reasons. Use our community as a case study of this fact: Our community is made up of singles, retirees, empty nesters, and families. We are 17 adults and 11 children, all full-time residents. The adults range in age from mid-30s to late-60s, the kids from one year to 16 years. We have four school teachers, three university professors, three architects, a graphic designer, a computer scientist, a web designer, and a finance director from a local nonprofit. Three of our nine households are comprised of people of color. Every family and individual had different reasons for joining us. One woman moved from another local cohousing community because she wanted to be closer to the performing and visual arts venues where she attends events two to three times a week. A couple of retirees lived on Capitol Hill for 30 years before joining us. They had looked into cohousing before but didn’t want to relocate to a more residential part of Seattle. Our site is halfway between their two previous homes, and gives them the urban density they desire. Many of the families in our community already lived in the neighborhood but were renting and, in addition to community, liked the housing stability cohousing provides. Our location has the added benefit of proximity to city transit, such as Seattle’s Light Rail. Our residents who work at the University of Washington appreciate being one stop away from the campus by light rail. This is a community in which my husband and I plan to age in place, so we wanted to live in a neighborhood that was vibrant and diverse, with all of my daily needs within walking distance. Just within our community, there are varying and unique reasons for being attracted to cohousing in an urban environment. Our urban location makes neighborhood connections possible by proximity and daily reminders of these pressing community needs. Many in our community are involved in our neighborhood. Several members are involved with a local homeless youth advocacy, job training, and housing services organization. I serve as the chair of Seattle’s Planning Commission and am involved with the Chamber of Commerce and my daughter’s public school PTA. I also serve on the board of an advocacy organization for affordable housing in our county. My husband chairs the Capitol Hill Ecodistrict and the Disaster Preparedness committee for our professional association. Two of our community’s teenagers are very involved with an LGBTQ youth organization. We have a rooftop farm that provides produce for a farm-to-table restaurant located about six blocks from our building. And we have been talking with the local community college to engage their sustainable agriculture students in internship opportunities. Our urban location makes these connections possible by proximity and daily reminders of these pressing community needs. 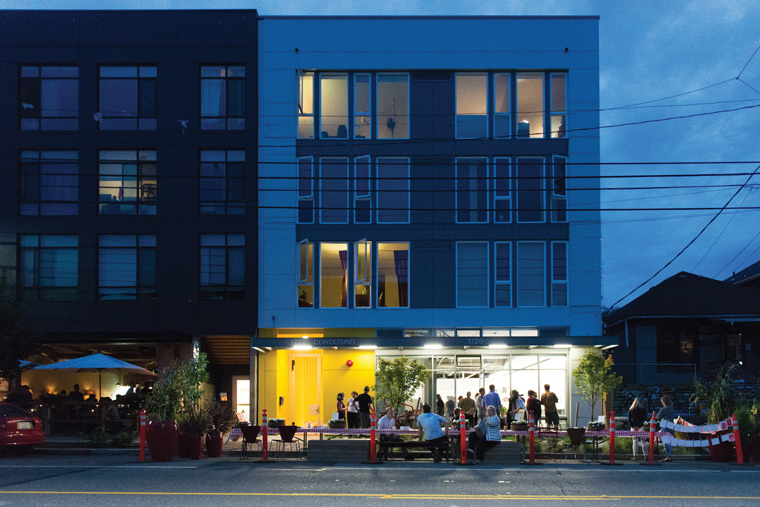 What does urban cohousing look like? Urban cohousing looks a lot like suburban and rural cohousing, just concentrated in a smaller footprint. In our building, we reimagined the idea of the pedestrian path vertically, connecting our homes with a common staircase and shared balconies. Instead of a large outdoor recreational area, we have a central courtyard that serves as a dining area for meals, play area for children, and gathering space for meetings or events. Our Common House anchors one side of the courtyard and provides a common kitchen, and more eating and meeting spaces. The large glass, French doors that connect the Common House to the courtyard give us flexibility in using the two spaces. The three homes per floor share access to a balcony that overlooks the courtyard. This exterior space means we can see each other come and go and has the added benefit of reducing our heated and conditioned spaces. When he visits, my father says our building “feels so alive.” There is life and activity all around to remind us that we are not alone. This is true for all cohousing, and possible in an urban environment when we consider traditional cohousing elements in new and imaginative ways. How does community come together in urban cohousing? Cohousing in an urban environment doesn’t make creating community any more difficult than in rural or suburban cohousing. Depending on goals or values, different cohousing communities will come together for different reasons and in different ways. In our community, we come together for meals. We have dinners three times a week—just about every other day. Our meal program has mandatory cooking participation, and, because of the ease of our system, we have high participation. There are times that the teenagers don’t come, or that one of us has an after-work meeting, event, or are simply out of town but there are often guests—sometimes several—and it generally feels like a dinner party. While people are welcome to take a plate to go, it is more typical that people in our community linger after dinner to share in continued conversation. We also come together in our civic engagement. In the Common House, we host events for the nonprofit organizations that we support. Sometimes we have sign painting parties for rallies and marches, and we’ll host friends and fellow marchers for dinner after those events. And, of course, we love to come together to celebrate birthdays, anniversaries, or weddings. We never have more fun than when we get to eat cake and to dance. But I need a garden! When we were recruiting for our group, and even now when I make presentations about our urban community, I often hear “but I need my garden.” And to address this concern, we talk about all the many ways we bring nature into our homes and community. While most people think they need dirt in the ground, we know that in urban locations, the dirt in the ground around us is sometimes contaminated from spills, or leaching, or simply car pollutants like oil, lead, and brake dust. In our community, we garden with raised bed planters, we import clean soil, and we control what goes into it by farming organically with no chemical pesticides or fertilizers. In our rooftop garden, we produce food for our community dinners but also for our neighborhood restaurant partner. On our balconies and private terraces, we plant fresh herbs and flowers. We each have a chance to garden in the way that works for us, and we can bring the natural world indoors. Urban sites can also provide easy access to parks and other green areas, so the children in communities like ours rarely want for space to run around and play, even without a traditional yard. Urban is not for everyone, but for those who are interested in cohousing without losing access to the amenities, conveniences, and vibrancy of city life, it can offer a unique alternative to other types of housing. Our urban community is far from perfect, but we all feel quite lucky to have the community and quality of life that we have found living here. Grace H. Kim is a member of the American Institute of Architects and co-owner of Schemata Workshop, based in Seattle, Washington. She is also the cofounder of Capitol Hill Urban Cohousing (for whom Schemata Workshop served as architect). Grace is an internationally recognized expert in cohousing, with a special expertise in Common House Design. She has served on the board of the Cohousing Association of the US and has visited over 80 communities in Denmark and North America. Grace gave a TED talk on cohousing which can be seen at www.ted.com/talks/grace_kim_how_cohousing_can_make_us_happier_and_live_longer. ← All DVDs on Sale – Only in January!